I contacted Ms.Riddhi Thakur([email protected],921066239). She gave me the details like to complete 450-480 pages of PDF files within 18 days and i'll be getting salary of 20,000Rs. For this i've to pay 3600Rs as deposit money. In which 3000Rs is refundable. The work is genuine and the money(salary and refundable deposit) will be credited within 24-72 hours after submitting work. Also if the work not completed she told we can extend the work for 7 days for the first job. She had never informed me about cancellation of refundable amount if there is any error in the work. Once the payment is made they send me the attached MOU doucment in they said if there is no accuracy in the work above 75% it wont be refundable. In which i had dought and i enquired in Google so i found many of the data entry jobs are fake. 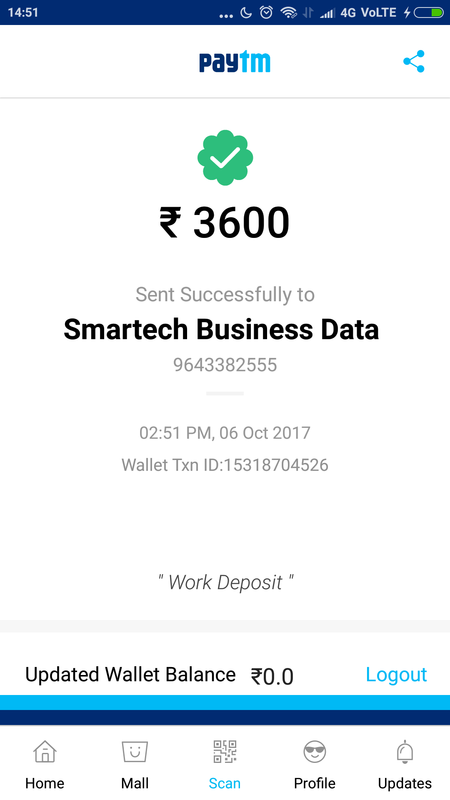 SO as i paid the money i started to work and i contacted their HR Deepak(9289500401) asking the genuinety he aslo gave the fake promised. Also in the complaints in google i fould they will be sending more than 700 pages of pDF file, in that also i had dought because i also received the same. But the Concern person Riddhi said me i need to type only 480 pages of PDF so there were 4 PDF files so i confimed whether i can 200 each from it and complete and she said ok. I also asked Deepak about this so he alsosaid(i have the voice note) some what same, but was not clear but Ridhi confirmed it. After 18 days,as per Ridhi said work can be extended for 7 days i sked for few hours extension. At that time company said there is no extension, but i said them according to the concern person Ridhi she said it can be extended. So they said no rule like that. So everything was just opposite what the concerned person said first.later they accepted few hours extension, so the 7 days extension which they said was fake. After submission i got the mail, like it wil take 7-14 days to find the error(NOT TO MAKE PAYMENT,THEIR INTENSION JUST TO FIND ERRORS AND REJECT). So that time also i said Ridhi told me 24-72 hours only needed to make the payment(all these were said before registring money). So they said NO. That was also different from the words first said. Then i got the email from them saying my work is rejected which is absolutely shocking for me. I contacted them so they said i didnt type 480 pages. So i said them i confirmed with concerned Ridhi during starting itself all this so she said me 480 pages of PDF to complete. Now they saying everything upside down. Now the company not making the payment of RS.20000 and also 3000s which was refundable.MOU is the legal document they saying but about the pages but its not mentioned in MOU. Somewhere in mail they given as note but which confirmed with Ridhi. According to agreement you have submit your work and for the kind information we have clearly mention in mail and in website also you have to type 480 pages of ms word. But you have submit only 288 page of ms word and you want we will accept your incomplete work and you are also forcing us to give salary or your continuously threatening us. We always inform our all candidates every time we will not accept incomplete work and the same confirmation mail we have forward to you and we have proof also. So please don't misguide people. In website and in mail we have clearly mention that you have to type 480 page of ms word and this is your fault you haven't read this line. You are not accepting your fault and you are trying to blaming us. You are putting same complaint in different different side. But you are not accepting your fault and try to ruin our company online image. So mam its humble request to you if you can understand accept your mistake and do not put these type of wrong comment in different different sides. I'm still strong about my complaint against Smartech business data Solution. I asked the concern person which was given to guide me Ms.Ridhi Thakur regarding this dought she told me to convert 480 pages of PDF to word. And company told me clear all doughts with Ridhi. But later what company's says and Ridhi says comes completely different after giving deposit money and work. Later they give many excuses.Someone else said me about these type of companies are fraud and they asked if we are doing the job why we should pay them.they should pay us why we should. Every genuine company are like even freelancing sites like upwork,people perhour.later only I came aware about all these. It's a big question.its my mistake. Now they said this type of answer for not returning my deposit money of 3600 and salary of 20,000. But if this was ok they would have said about error percentage. Only75% accuracy they will give salary and deposit money. And everything they will say rules and regulations after we depositing cash. dear all, they are taking 1% as error if we didn't put even a full stop. If one space comes next 1% they will . So just think we are typing this much and these type of errors will occurs because it's common and they really know that so they sure they can reject our work. They says part time job but to complete 480pages of PDF in 18days it takes up many sleepless nights. I want to make aware atleast one person who are going to register in this,thatsy im complaining and I'll go forward with my complaint atleast I get my 3600s which I gave them. For them it's simple to say it's rejected we won't return. Even they don't pay for my work I done I'll be fine but I'll definitely fight to get back my 3600s.ill definitely fight. To All, don't pay for the work you doing never ever. You should be paid. Not them.